There are lots of occasions in the books when Hogwarts grounds are hard or impossible to enter. And while they give lots of additional magical protection to it, the main thing that divides the inside and outside of Hogwarts' territory is the wall. But I was always wondering why no one ever thought of entering the castle grounds through the Forbidden Forest? The forest seems huge - it's big enough for centaurs, acromantulas, thestrals, unicorns and occasional giants to live there without fighting for space. 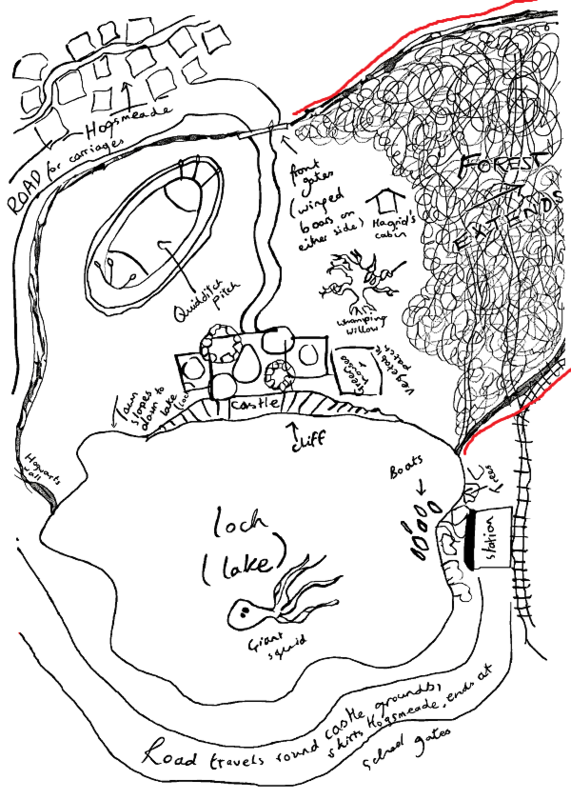 Even then, there is enough space left for a convict on a run to hide, Death Eaters to put their rest camp, Hagrid to organize lessons, and four Dragons to be kept without bothering other inhabitants. However big and dangerous the forest is, it surely should have an end somewhere miles away from the castle. Maybe somewhere in the mountains. Why not enter the forest there and pass through it to reach the castle? Or at least it could be considered as an option when you try to protect the castle grounds from unwanted intruders. Does that mean that this huge forest is also surrounded by the castle walls as a part of the castle grounds? That's a strange thing to imagine as it's going to be huge like the Great Wall of China really and it makes the centaurs trapped in the forest like in a natural reserve. Are there any indications in canon sources of how the Forbidden Forest is protected from the sides that are not facing the castle? We also learn that the forest "extends" in a broadly North-easterly direction. The books seem to describe a mountain (range?) to the North-east of the castle so the forest may run up against the foothills. Smashed our way through the boundary by the forest, Grawpy was carryin' us, Fang an' me. I take this to mean that he did not simply come in through the forest with no physical obstacle. It would either mean that there is a boundary (wall) preventing one from entering the forest, or that they came through the boundary near the forest but there is actually no boundary around the forest. If the latter, though, why didn't they just come in through the forest without having to smash through the boundary? Hagrid of all people should have no trouble entering through the forest. I think it is therefore likely that there is some sort of boundary wall preventing one from simply entering the grounds through the forest. This could either be a wall that encloses the entire forest, or it could be a wall that runs through the forest (i.e. if the forest is so big it is possible that part of the forest is on the school grounds and enclosed, but the rest of the forest extends unprotected). "There's only one way in now," said Aberforth. "You must know they've got all the old secret passageways covered at both ends, dementors all around the boundary walls, regular patrols inside the school from what my sources tell me. The place has never been so heavily guarded. This too would seem to indicate that the forest is protected by the wall. Otherwise the dementors all around the boundary walls wouldn't really help if anyone could simply avoid them by going through the forest. In any case, it seems clear that there is some sort of barrier around the forest, because throughout the series no one ever suggests the forest as a way to enter the grounds. When, throughout Prisoner of Azkaban, everyone is trying to figure out how Sirius could get in, no one said "hey, maybe he came in through the forest". Similarly, in Half-Blood Prince Dumbledore asks Malfoy how he managed to smuggle Death Eaters in, and doesn't even consider the possibility that they just waltzed in through the forest. They're guarding every single entrance to the grounds. 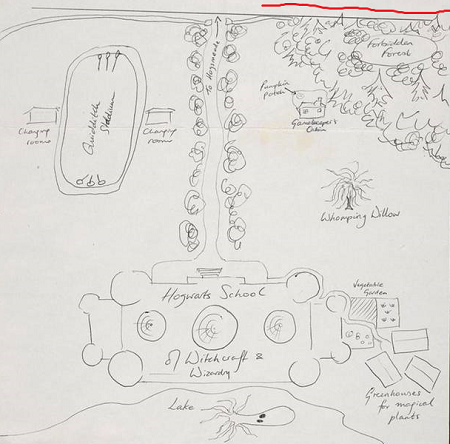 "Every entrance" and "every single entrance" indicate that there are actually several entrances to the grounds, yet in the books we only see two entrances (the front gates, and the lake), not counting the secret passageways. Thus, there would seem to be other entrances that we are never told about. One of them might be the forest. So it may have a protective barrier, but also have an entrance. During the events of Prisoner of Azkaban and Deathly Hallows it would have been guarded by dementors, and perhaps by aurors during Half-Blood Prince. Not the answer you're looking for? Browse other questions tagged harry-potter forbidden-forest or ask your own question. Are the creatures in the forbidden forest stuck on Hogwarts grounds? How large is the Forbidden Forest? How forbidden is the Forbidden Forest? Why were there so many magical animals and creatures in the Forbidden Forest? Why wasn't Snape's punishment for Ginny, Luna and Neville for attempting to steal the Sword of Gryffindor more suspicious to Harry? Why didn't Harry die in the Forbidden Forest? Why Did Lupin and Snape never spot Sirius in animal form during Prisoner of Azkaban?